Our large variety of van and RV bases offer a broad choice of applications and leave your preferences wide open. 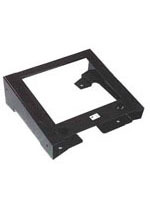 We have front seat bases for almost all applications in most vehicles. Center seat bases will with high back seats in vans and low back seats in RV's. 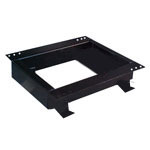 6 way power bases will add the maximum comfort with multiple adjustments. Seating systems manufactured to meet or exceed FMVSS 207 DOT safety standards per sections S4.2 and S4.3. Multiple front to back bolt patterns. Requires one hot wire to fuse panel. Extended lead time if not ordered with seats. Complete bolt in package with riser and double seat belt bar. Requires a ground wire attachment and 12-V power from the fuse panel. Sold only with #110995, #110996 listed above. Raises power unit to retain original seat height. Driver base will will clear standard electronics module under seat. Not Available for 07+ GM driver with fuse box under seat. 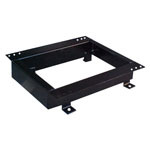 Complete bolt in package with riser,swivel plate and double seat belt bar. Approved for seats without air bags and all vehicles over 8.000 lbs GVW. Leaves stock manual slides with piro attacment in place. Top bolt pattern width will need to be expanded from 14" to 14 1/4" on power unit for stock slides. Includes piro bracket for seat belt reattachment. unit to retain original seat height. Bottom bolt pattern is an exact match up to Ford factory floor bolt pattern. 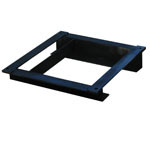 Top bolt pattern 14 x 11"
Includes 360 degree swivel plate. Customer must provide floor bolt pattern.